It seems weird, but for me, these types of activities don’t need eye candy, but effectiveness and speed. And these apps provide that. They are also all free to use and work on several platforms. I’m especially happy with mutt and canto. Mail and feeds, in the amounts I consume them, usually take up huge amounts of time. With these apps, I can zip through them relatively quickly. As a vim user and CSS author, I’ve found the css_color.vim syntax file to be pretty handy. It shows hex codes in their actual color. If you use vim and do much CSS, you might like to try it out. 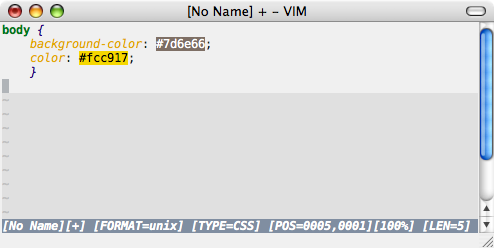 css_color.vim in action: hex values are underlayed with the corresponding color.